The Ivy Model 6000 is a portable or bedside monitor that provides continuous monitoring of Pulse Oximetry and End-Tidal CO2 parameters for adult, pediatric and neonatal patients. 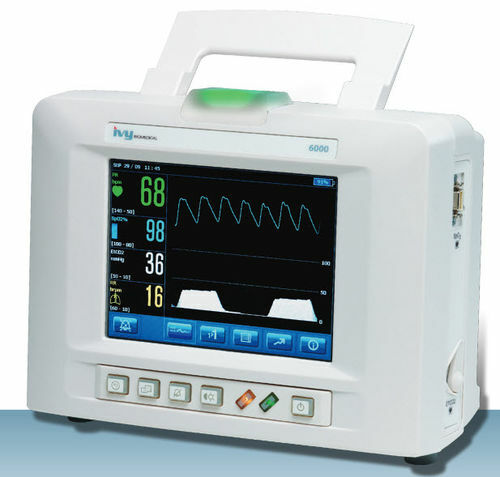 The medical device can connect directly to existing hospital network infrastructure using wireless 802.11 b/g or serial connection. Once patient cables are connected and the monitor is acquiring data, no adjustments are necessary. Clinicians can automatically bracket the patients current physiological parameter values with appropriate high and low alarm limits easily. The touchscreen interface provides intuitive views including Waveform View, Transport Mode (Large Numbers/Values), Trend View, and Data View. The front panel buttons offer fast access to system settings.